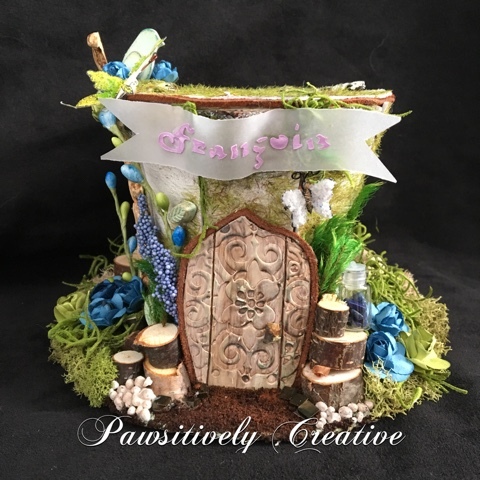 Please say hello and a big welcome to today's Guest Designer - Niki of Pawsitively Creative. Niki was the winner of our Time to Take Flight challenge. Hello lovelies! I am stoked to be here as a guest designer and to be among so many wonderfully talented people's. 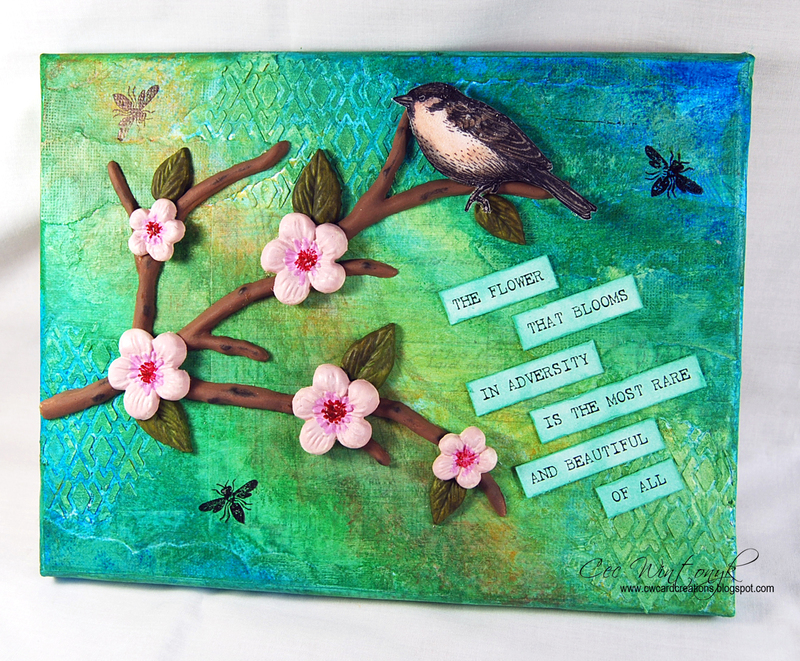 As the winner of the Time to Take Flight challenge, I was asked to create something for this months theme of "Elements of Nature". Before I get into the design process here is a little bit about me. 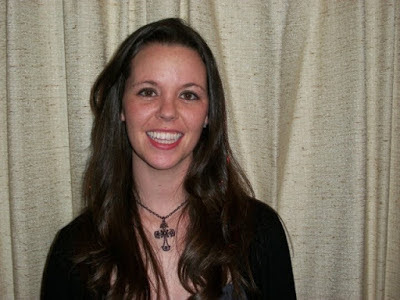 By day I am a Vet Tech ninja and have been in the Veterinary field for over 13 years. I love my career and being able to use my knowledge to help save any and all animals. Yes, I enjoy the scaled ones, the slimy ones and the smelly ones (baby skunks are adorable!). 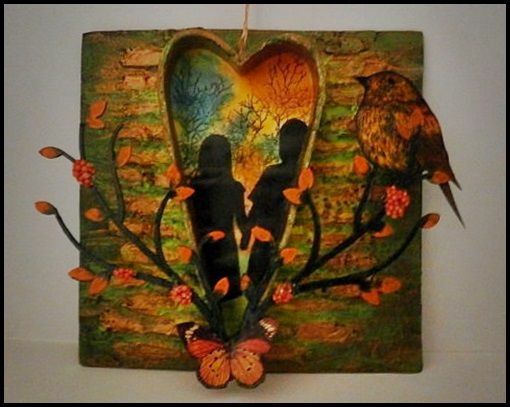 I still consider myself new to mixed media and challenge blogs. Back in April 2014 my husband bought me a couple of canvases and an acrylic paint set for my birthday. I wasn't thrilled about it at first. When I was younger I drew, painted, and crafted all the time but at age 17 I broke both of my arms, and never got back into my art because I couldn't use my left hand/wrist like normal. I gave up my art. So when I saw the art supplies my husband bought me I figured I would give it a go just to make him happy. Boy was he (and I) in for a huge surprise when I finished my first piece. At the time I loved it but kept thinking that I could improve, and I like to believe that I have improved by leaps and bounds due to the challenge blogs that I found and also because of the wonderfully talented and supportive people I have found in blogland. You all make me challenge myself every time I create something and I just want to say thank you very much for that. I have created a mini garden top hat. 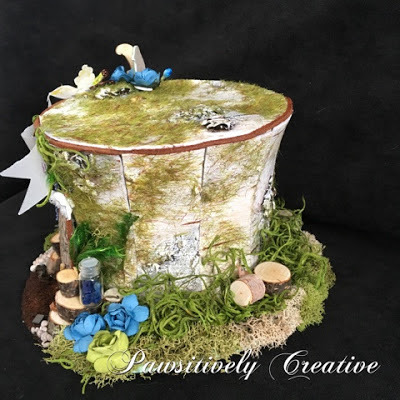 This started out as white crafters foam and then I overlaid the top hat with birch tree panels. Once the panels were in place I did the same thing to the top of the hat and used some brown leather to define where the top piece met the sides. 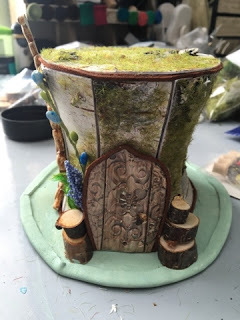 While that was drying I set about making the little door, the leaves, and the filigree mold. 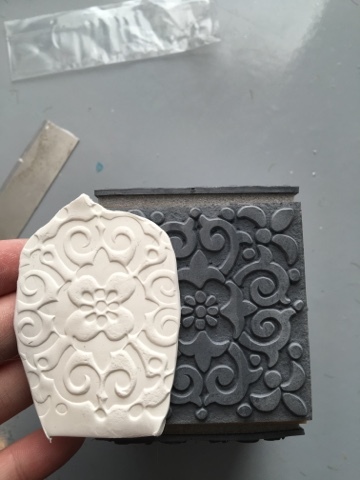 The door was rolled out with white polymer clay that I then stamped into. Cool huh? I used an X-ACTO knife to cut the door into 3 pieces. 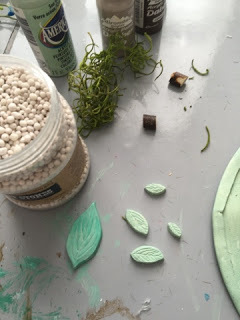 All the clay parts were baked then painted with a mix of raw umber acrylic paint, Adirondack dabbers, espresso distress paint and some Silks with a dash of Emerald Green Viva Decor. 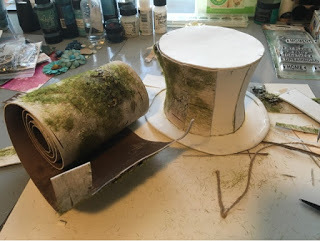 I then painted my hat with some sea foam acrylic paint and started laying out moss, English moss, and little tree stumps (a stick I cut up with a jig saw). I used some flower picks that were leftover from a previous project. Everything was glued to the brim of the hat with a hot glue gun since I ran out of my favorite glue. The "dirt" path was made from coffee grounds and the stones are art stones that were painted with distress ink. I wanted to put a fanciful spin on this design so I got out my stencil and used some washi tape to isolated one word. 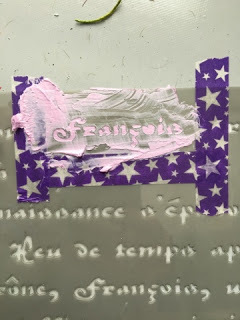 I stenciled this on a piece of frosted vellum with some modeling paste. Then all of the bits and bobs were added to the hat! Viola! 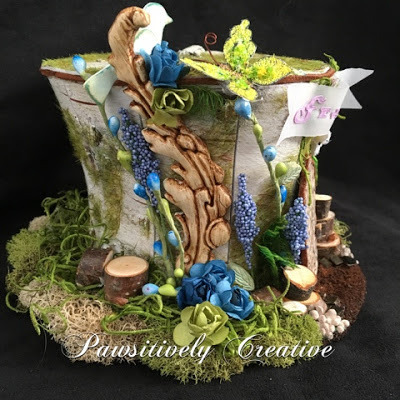 Mini garden top hat! Here are some pictures of the sides of the hat. This side shows the filigree piece. This side of the hats shows the little jar of blue stones that bring good luck to the owner of the top hat house. I added some butterflies, flowers and a little bird to finish off the piece. Hopefully something in here inspired you to create a design for this challenge. I sure had fun with it! What a wonderful project and step x step from Niki. 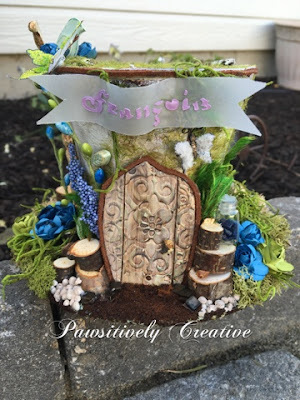 Now that she has inspired you, we would love it if you would create something for our Elements of Nature challenge since it doesn't end until next Wednesday. 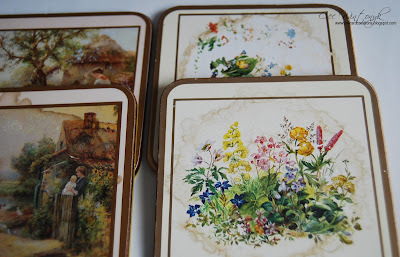 It is Cec here and I am bringing you some inspiration today in the form of some upcycled coasters. I have a bunch of coasters that really should have been thrown out long before now because they have stains on them or little torn spots but the other day I had a bright idea that maybe I could salvage them. I started by covering the back with some painters tape since I wanted to make sure I didn't damage the cork backing. Next I covered the front and sides with a couple coats of Liquitex Gesso. 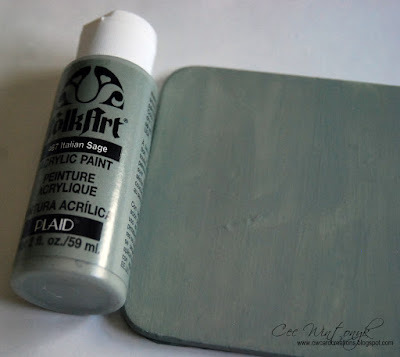 The next step was to paint the coaster with some Folk Art acrylic paint called Italian Sage. It took two coats to get good coverage. 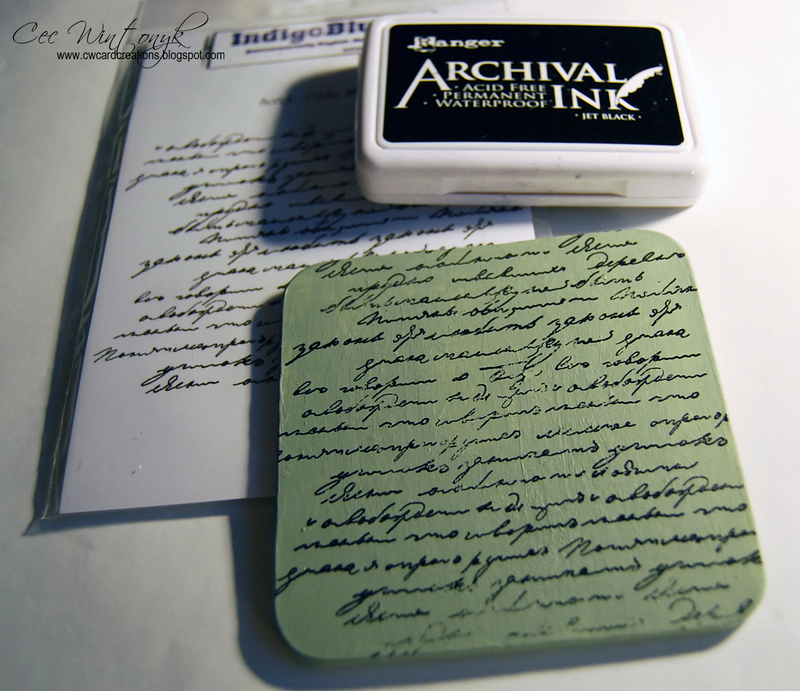 Next I used Jet Black Archival Ink and an IndigoBlu stamp called Script Background to add some stamping to the coaster. 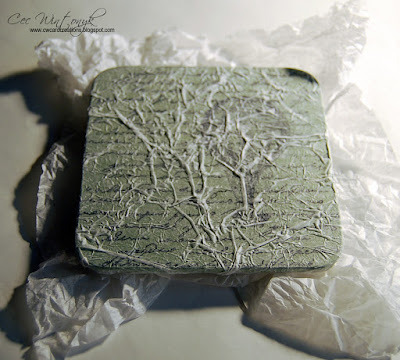 I crumpled up some tissue, flattened it back out and adhered it to the coaster with some Mod Podge. This photo was taken of the first attempt at altering the coaster so there was another stamped image that didn't make it on the second version that I am showing you today. Once the tissue is dry, I trimmed the excess away and added another coat of Mod Podge over the tissue. Try not to touch the tissue while it is wet because it does tend to disintegrate and you don't want it to come off areas where you want it to be. The next step was apply some inks of various types in random spots. 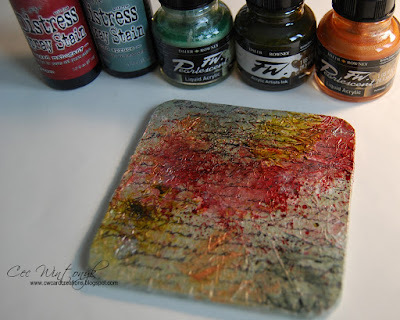 I used Tim Holtz Aged Mahogany and Iced Spruce Distress Spray Stain along with some FW acrylic inks in Pearlescent Copper, Pearlescent Silver Moss and Antelope Brown. I then used Jet Black Archival Ink and a set of stamps from Hero Arts to add some butterflies to the coaster. I heat set them and then put a coat of IndigoBlu Super Thick Slap It On over the coaster to seal it. 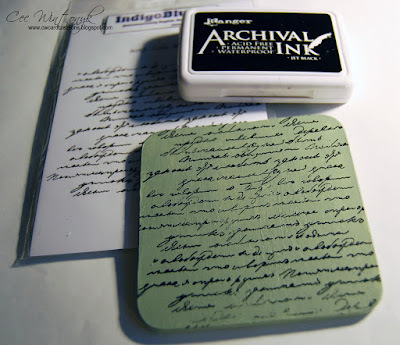 In the future I think I would wait a couple days to ensure that the stamping is really set because the ink still moved a bit when I added the sealer but it wasn't so bad that I couldn't use it. Here is a close-up view of the finished coaster. I hope you are inspired to rescue your old coasters and give them some new life. 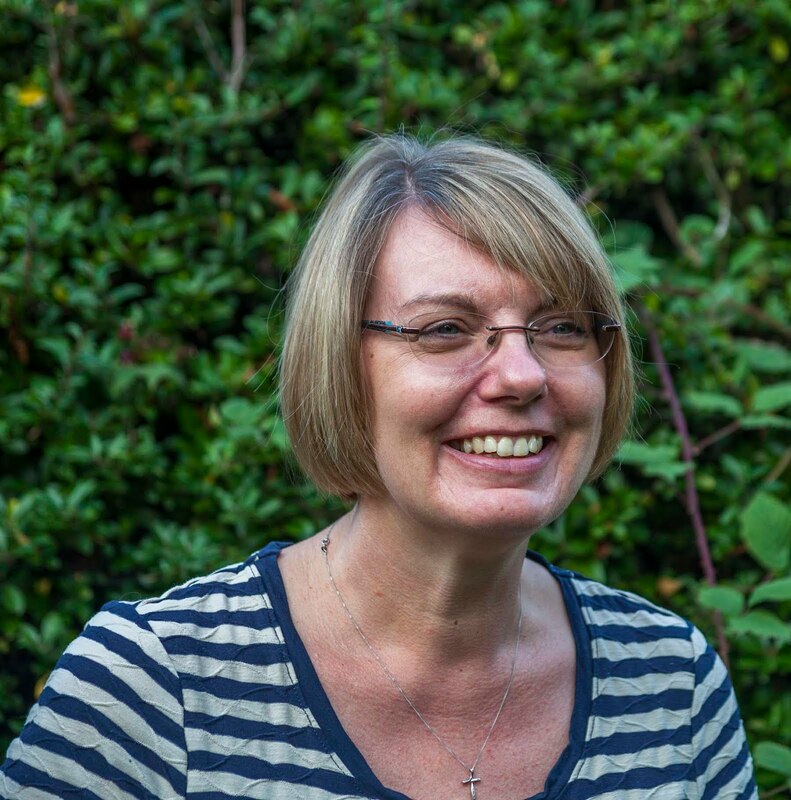 Hi everyone, Ruth here with an inspiration post inspired by the current challenge theme 'Elements of Nature' . Skeleton leaves were one of the first crafty items I bought many, many years ago to make some cards and I have had some in my stash ever since but never thought of another way to use them that wasn't..well if I'm honest a bit naff. Not wanting to get rid of them they have been moved from one place to another and then when I saw what this months challenge theme would be I decided it was their time! So here is my second creation incorporating skeleton leaves....a nature book. I started off with a book that had disintegrated and decided to recycle the covers, taping them together with a space for the spine. I will make a text block at a later stage that will fit inside....I do love handmade journals. Inspired by a cheesecloth covered book on pinterest I gave the covers one coat of gesso and applied some muslin whilst it was still wet, I then painted more gesso on top and scrunched the muslin up a bit. 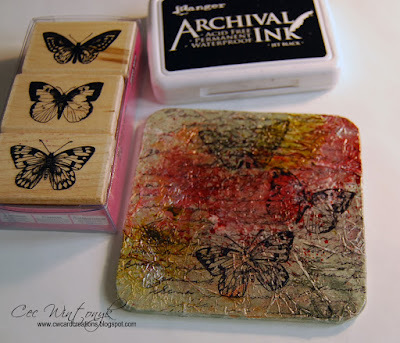 Once dry I spread a thin layer of grunge paste over and stamped into it with a Lin Brown leaf stamp. Spray the rubber with a mist of water before stamping. I just made a random pattern. This created some lovely texture. I decided to apply skeleton leaves to just the front and leave the texture showing on the back. I applied the leaves whilst the grunge paste was still wet, trimming where I needed to and then left it to dry. Once dry I applied a coat of gel medium to make sure all the leaves were stuck down. I also added a few tiny art stones. I used pinflair book binding glue to stick the muslin to the inside covers. Next heat embossing on a skeleton leaf with frantage shabby white enamel. This is the same method I used for my herbarium in last weeks post, but I used gold powder that time. The book was ready for a dry brushing of fresco paints in snowflake, nougat, toffee and french roast. I also used a fine text stamp to add some further detail. I then applied torn pieces of the skeleton leaf to the front. A tickle of white fire treasure gold highlighted the neutral colour palette. I nearly left it as it was, particularly as it's much easier to work in a journal that has very little dimension on the covers but I decided to use some more of the natural elements and encase them in UTEE. I put a little glue on the base of the microscope slide and stuck it to my craft mat before sprinkling in some pieces of the skeleton leaf, micro beads and gilded seed heads, then I poured clear melted UTEE in before sprinkling some more tiny additions. 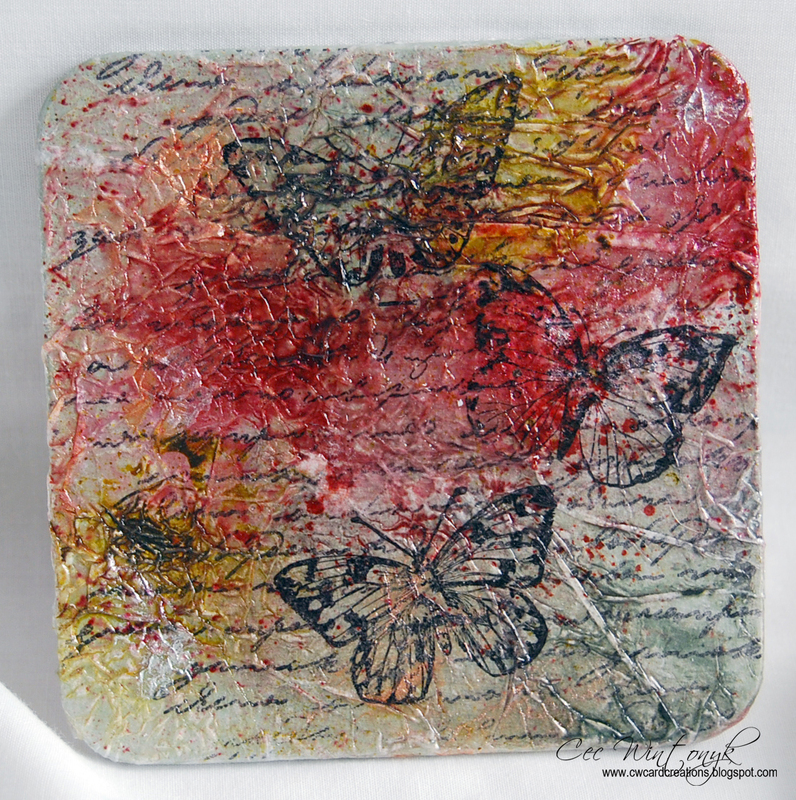 The splashed of white are melted embossing enamel on the leaf and just adds a lovely highlight to the piece. A little gilding around the edge of the slide to finish off. I have loved using skeleton leaves again and have further ideas to experiment with them in encaustic wax...just goes to show you shouldn't throw anything way in crafty land! I do hope you've been inspired to join in with our challenge or experiment working with natural elements as there is an abundance at this time of year. 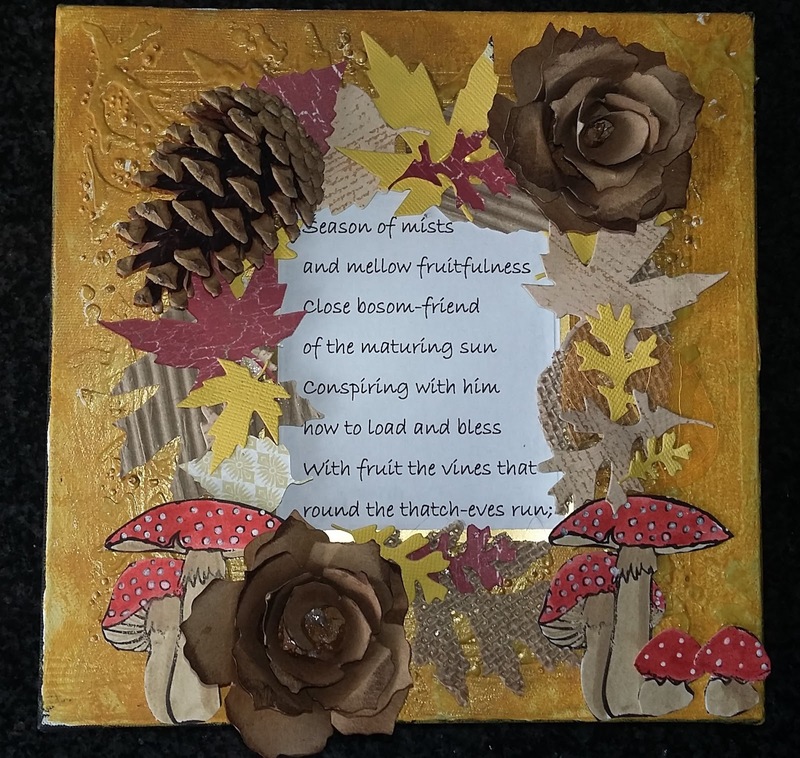 It is time to announce the winner from our Autumn Colours challenge and share the Top Three. There were some fabulous projects with warm fall colours but the Design Team kept looking at them until they agreed that their winner was #19. 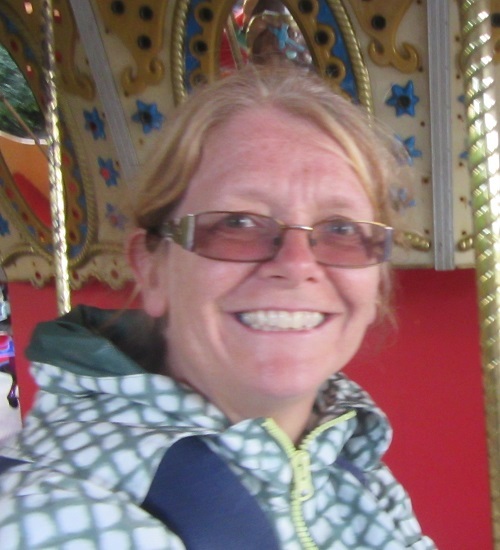 Congratulations Kerstin! 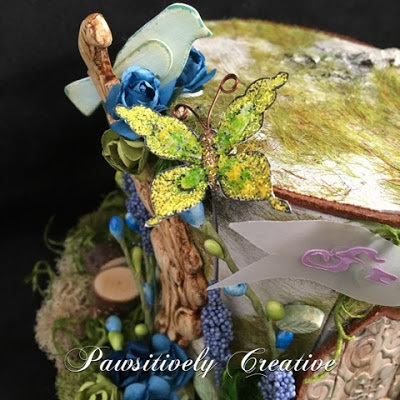 This was such a lovely layout with so many special embellishments and all the colours that fall brings forth. 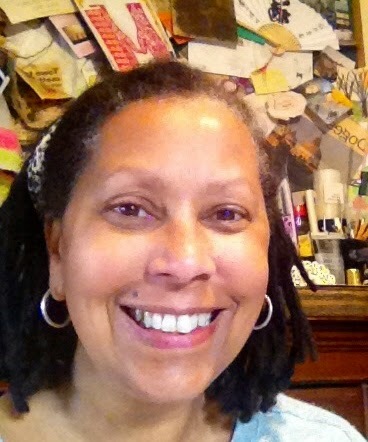 Cec will be contacting you shortly to discuss your Guest Designer spot. Congratulations to our Top Three as well. Please email cwcardcreations@rogers.com to claim your Top Three badges. 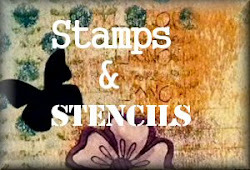 All our winners will be pinned to our Stamps and Stencils Pinterest Board.. The current challenge, Elements of Nature is running now and you have lots of time to share your projects with us so we hope you will join us. 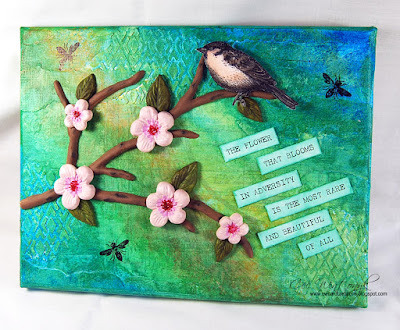 Welcome to Stamps and Stencils and our October challenge, Elements of Nature. I'm Autumn and I'm your hostess for this month's challenge. I know you will be inspired by our design team's fabulous creations. Please take the time to visit their blogs for the details on their lovely projects. Whether you are inspired by the glorious world around us with the changing seasons, or tempted to use elements of nature in your art work, this month we'd love to see your nature inspired entries. Anything goes as long as you include a natural element in your art which can be either stamped or an actual item! As always you need to include stamping or stenciling. Over to you now! We cannot wait to see your creations for this challenge. Happy autumn from the Stamps & Stencils design team! The challenge is open until Wednesday, November 2, 2016 at 20:00 UK time.